NOW OPEN AFTER FLOOD RENOVATIONS!! Now Open After Flood Renovations! The Southwest Connection is by far one of the most unique shops in all of Howard County. 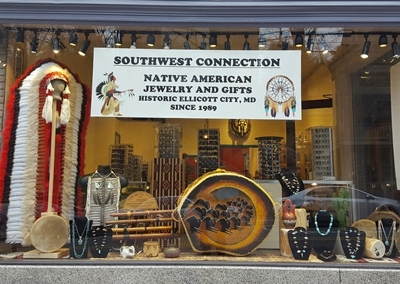 All items are hand picked by the owners who take many trips out West to source out the most unique and authentic Native American jewelry, gifts, crafts and music. Some of the items on display include sterling silver jewelry, handcrafted in New Mexico and Arizona by Navajo silversmiths, beautiful Native American turquoise jewelry and traditional native pieces including rings, earrings, necklaces, watches, bracelets and charms. Browsing the store you will also find many other Southwest inspired house wares and a wide selection of Native American Indian music on CDs and cassettes.